Strawberries are currently crazy cheap in Sydney. In some fruit shops, they're selling for 5 punnets of 250g each for $5! 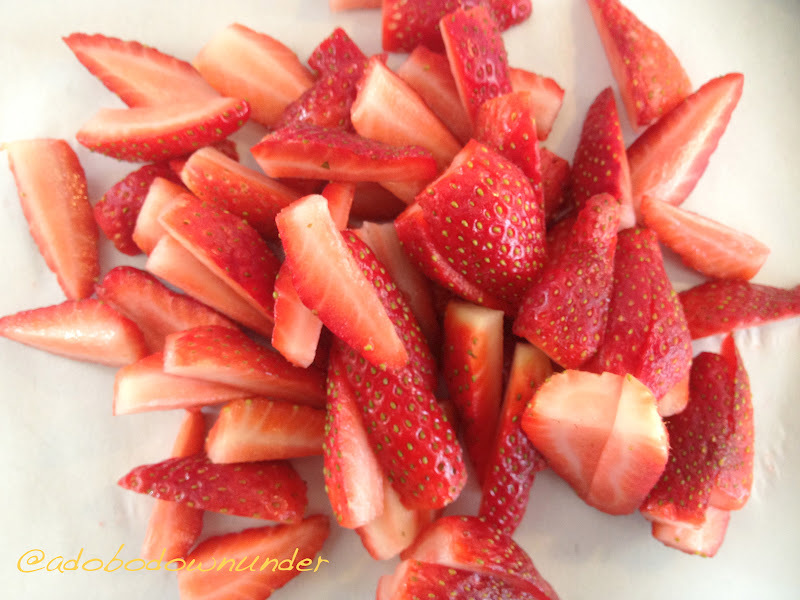 The strawberries are sweet and crisp and mostly coming from the sunny state Queensland. We like strawberries fresh at home, packed in lunch boxes for the girls and sometimes drizzled with some home-made chocolate sauce. And then we found a new addiction. Home made strawberry spread. Well I can't really say its jam as it does not contain the usual ingredient for making preserves (pectin and other gelling agent), so we call it a spread at home. The recipe I used for making this was the same one I always use to make blueberry topping for my cheesecakes. Place the sugar and 2 tablespoons of water in a small saucepan. Put heat on low and stir until the sugar has dissolved. 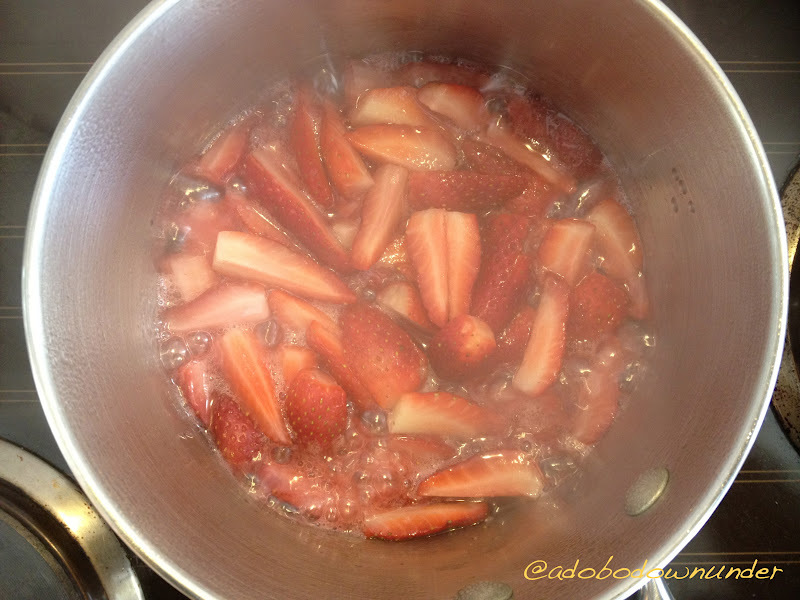 Increase heat to high and add the strawberries and cook for a few minutes until the berries are soft. In a small bowl, combine 2 tablespoons of water and the arrowroot. Add to the berries mixture and stir. Return to heat on low and cook until the juice thickens. Leave to cool. Then transfer into a sterilised jar. Anyone can make this at home, its easy and its quick. All you need is a sterilised jar (here's a link on how to sterilise jars) and you're good to go. The quantity for this is really small and this usually lasts us a week. But because its quick and no fuss, we just whip it up anytime we need to. You can also use it to top your desserts! I'm thinking a NY style cheesecake will taste berry-licious with this on top.